An immediate extension of a fishing ban is desperately needed to save the world's most endangered marine species. Campaigners say there are only 30 vaquita porpoises left, with their population having plummeted by 90% since 2011. These dark-eyed cetaceans are often accidentally killed in gillnets which were banned for two years in 2015. Researchers hope the Mexican government will now extend the ban due to expire at the end of May. The vaquita marina species are found only in the Gulf of California, a world heritage site that sits between the Mexican mainland and the Baja peninsula. The waters are home to a wide array of species, but they also support half of Mexico's total fisheries production. Gillnets, which are hung vertically to catch fish by their gills, have been widely used in the Gulf but were banned in 2015 in an effort to help the vaquitas. However this attempt has failed as fishers continue to work the waters, many looking to catch the Totoaba, a large species which is prized for its swim bladder. The bladders can fetch up to $8,500 a kilogram on the black market, such is the level of demand in traditional Chinese medicine. The vaquitas are often the unintended victims of these illegal hunts. Numbers of vaquitas have plunged by 90% since 2011. 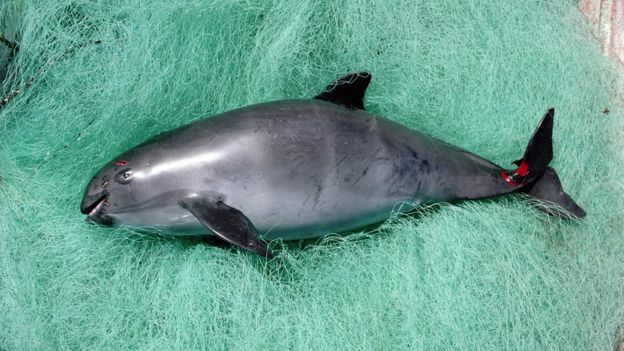 In March and April of this year five dead porpoises were recovered, three of them killed in gillnets. The ban on gillnet fishing, while ineffective, runs out at the end of May. Campaigners believe the immediate survival of the vaquita depends on the Mexican government extending and strengthening the ban. Without it, they believe the species could all be gone by the middle of 2018. "You are in a situation with a critically low number of vaquitas and a limited window to protect them," said Chris Gee from WWF. "We want the gillnet ban enforced and in place permanently, without that we are very sceptical of the situation. It's a difficult situation. Extinction is imminent is nothing is done." The campaign to extend the ban has attracted the support of the actor Leonardo Di Caprio who has been using social media to highlight the plight of the vaquitas and to encourage his followers to put pressure on the the Mexican President to act. 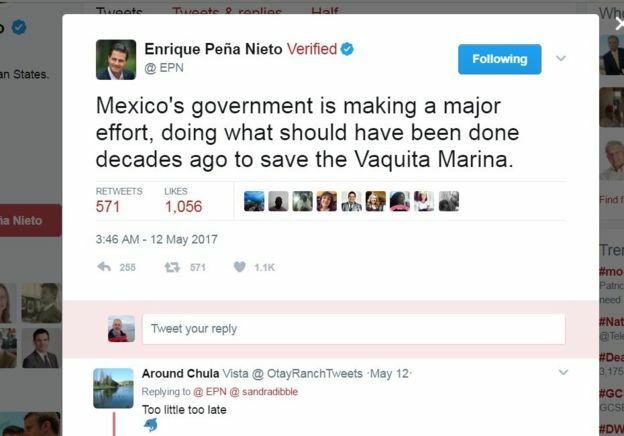 Mr Di Caprio's efforts have seen the President, Enrique Peña Nieto, respond directly on Twitter, defending his country's actions to protect the porpoise. As well as efforts by the Mexicans, WWF are also calling on the US and Chinese governments to take steps to stop the trade in Totoaba which is indirectly impacting the vaquitas. Other more radical plans are also under consideration. Scientists, working with the US and Mexican navies, are trying to use bottlenose dolphins to locate vaquitas in the Gulf of California. The idea is that if a few can be captured and moved to safer waters, the species could be re-introduced when illegal fishing and other threats are dealt with. "If there's a special sea pen that could protect some of them you could see some of them re-introduced when the Gulf is free of gillnets," said WWF's Chris Gee. "It would take some time, there are scientists who are confident they can find ways to make this work, and yes it is an extreme measure but it is an extreme situation."